Lexington, Va.—March 26, 2019—The The U.S. Hunter Jumper Association is pleased to announce Kym K. Smith as the title sponsor for the 2019 Kym K. Smith/USHJA Young Hunter Pony Championships, which will take place on August 25, 2019, alongside the Sallie B. Wheeler/USEF/USHJA Hunter Breeding Championships – East Coast at the Virginia Young Horse Festival at the Virginia Horse Center in Lexington, Virginia. The Kym K. Smith/USHJA Young Hunter Pony Championships aim to develop the Hunter Breeding sport and create opportunities for current and new owners, breeders and handlers to showcase talented young Hunter pony prospects. 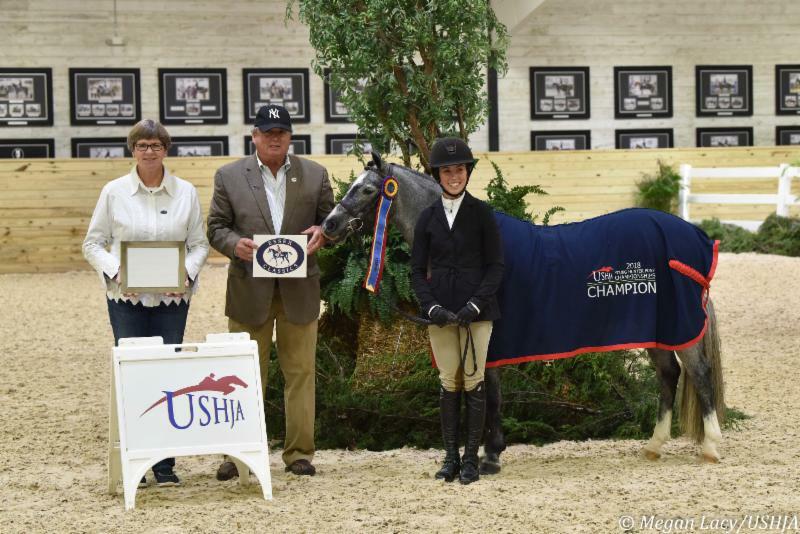 In its inaugural year, the USHJA Young Hunter Pony Championships paid out $18,500 in prize money and crowned six overall winners across sections divided by age and height with ponies from across nine states represented. In 2019, a total of $20,000 in prize money will be awarded across sections divided by age and fence height for ponies seven years old and younger. "I am so excited to partner with the USHJA to bring exhibitors the Kym K. Smith/USHJA Young Hunter Pony Championships," said title sponsor Kym Smith. "It is a true honor to have young ponies presented during Virginia Young Horse Festival alongside the Sallie B Wheeler/USEF/USHJA Hunter Breeding Championships-East Coast, and I believe these Championships not only give breeders, handlers and owners an opportunity to showcase their young ponies before they do the green division, but to also see what it is like to bring a young one along, the patience it takes and mostly the bond you create." The Kym K. Smith/USHJA Young Hunter Pony Championships will offer the following sections at the 2019 championships: Hunter Pony 4 & 5 Year Olds 2’, Hunter Pony 4 & 5 Year Olds 2’ or 2’3” (exhibitor’s choice), Hunter Pony 6 & 7 Year Olds 2’, Hunter Pony 6 & 7 Year Olds 2’ or 2’3” (exhibitor’s choice), and Hunter Pony 6 & 7 Year Olds 2’6” to be made up of one model, one under saddle class and two over fences classes. A section for 5 Year Olds & under for ponies not competing over fences classes will offer an under saddle class, an under saddle class to be made up of 30 percent conformation, and a model. While riders in the Kym K. Smith/USHJA Young Hunter Pony Championships must be juniors, sections are not further restricted by the age of junior competitors. "[The Championships are] a great venue to be able to showcase some of our young ponies that aren't ready to go out and do the real deal, and they are too young to go too fast," said Alicia (Lisa) Kline, president of the Virginia Pony Breeders Association, at last year’s Championships. "There was just nothing like this out there that we could present our ponies at other than maybe local association-type shows, which is fine, but this was a good opportunity to invest in and pursue." For more information, visit ushja.org/YHPC. For information about sponsorship, contact Whitney Allen at wallen@ushja.org or (859) 225-6707.